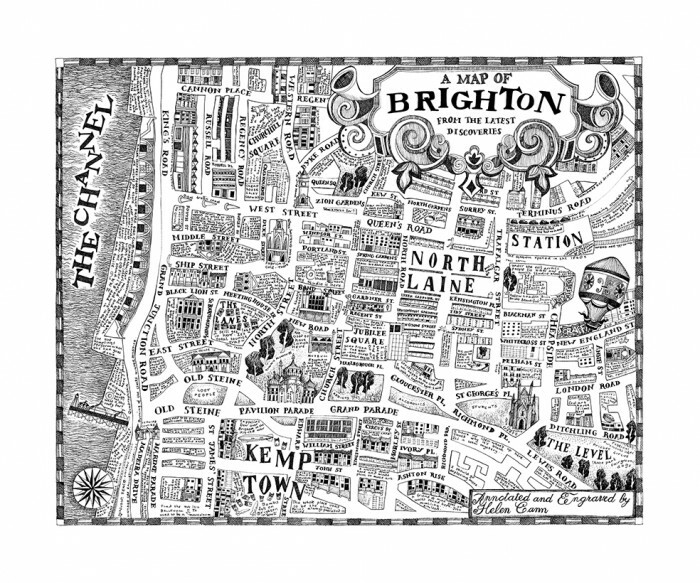 ‘A Map of Brighton from the Latest Discoveries’ maps my home city of Brighton, UK encompassing both local and personal history – psychogeography on a very basic level. I researched the history, architecture and historical maps of Brighton and took into account how the mapmaker (and his motivations) always colours the information curated, edited and presented. To see details more clearly on a digitally adapted version, please click here. This piece was first shown in the ‘Making Tracks’ exhibition at ONCA Gallery, Brighton. The original is rendered in ballpoint on a screenprinted base. Mounted in white and framed in a stained white wood. Limited edition prints (of 50), hand finished in gold leaf £220.00 are available to buy here.